I don't want to know anybody who would go to a concert billed as "Eric Haydock's Hollies" expecting to see the original band. Do people who see "Mike Pender's Searchers" expect the original members? I don't want to know anybody who would go to a concert billed as "Eric Haydock's Hollies" expecting to see the original band. Some members of the public are a little stupid, though! Dennis, again, please read my post of June 10th. Eric was billing himself as The Hollies, not Eric Haydock's Hollies or similar. That's what The Hollies objected to. James, it has nothing to do with the public being stupid - if a concert is billed as The Hollies the general public will expect to see The Hollies. That is a sweeping statement, James. 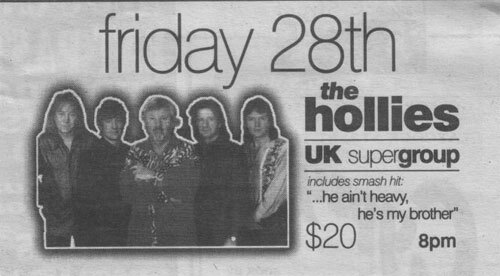 If you were to see a poster with 4 inch letters proclaiming "The Hollies", would that not be the band you would expect to see. That does not make them even a little bit stupid, does it! Who is appearing in the following shows. It is this sort of advertising that is the problem, not the fact that Eric is touring. As stated earlier, The Hollies have no intention of stopping Eric playing in any band. They just want the advertising to be done in accordance with the legal agreement between both parties. Not too sure what you are getting at Dennis but I can tell you there have been lots of people who have bought tickets for a "Hollies" show only to be disappointed. From the above adverts, is that not surprising? 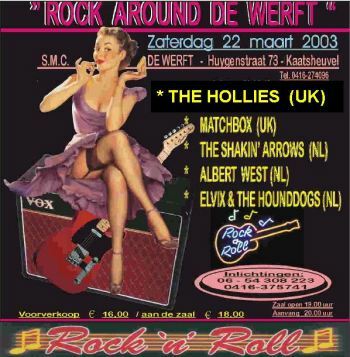 First time I have actually seen those posters, no wonder 'The' Hollies were a little peeved. Yes, that's pretty bad -- that would be something like Pete Quaife calling himself the Kinks. Thanks for sharing these posters with us, Rob. It's the first time I have come across examples like these and you can see why there was a court case to stop Eric using the Hollies' name. I think I would have been fooled by that third poster! OK. I'm convinced. Nothing like actually seeing something in black and white, or, in color yet! Yes, Eric has been a naughty boy, hasn't he? I wonder if this idea came from him or his manager (or the promoter)? These adverts were only three of many from various countries around the world and it matters not who put them out but ultimately, Eric is responsible for them. Perhaps everyone will now stop jumping to conclusions and getting at the band and let them get on with doing what they know about and love. That is one of the many things the guys do so well, they care about what they do, and it shows through with abundance. I hope things are going well for the guys and would like to send best wishes to them all. Thank you for replying yet again to this hydra-headed subject. It never ceases to amaze me that people who claim to be fans are forever posting critical, negative messages about the band and trying to make them the villains. Friends of mine had a summer holiday in Canada years ago and were delighted to see"The Hollies" appearing in a town near them. Needless to say, it was an "imposter". They told me that the reactions ranged from disappointment to downright anger (though directed at the "imposter", not the real band). I would hope that this closes this subject once and for all, although I'm sure it will surface yet again and have to be thrashed through yet again in a few months time. not really the question because many examples are there. the organiser of the event where the "act" is taking place this organiser really knows if he is getting the real thing ? and if he knows there something can be done against this party also they be as responible as things happen ? Unfortunately, not all organisers or promoters are aware of who they are actually getting, especially overseas, and when publicity is sent to them like the examples above. They are only pleased they are getting a band with such a well known name. If they are not aware and have erroneus publicity it is not their fault. There are those, though, that may know but like the fact that the name of "The Hollies" will draw in the crowds. The Hollies are booked through their management company and not through promoters, except in unusal situations, and the venue is left in no doubt which band will turn up. Also, The Hollies usually play alone, unless at a festival, and only on the main Concert Hall, Theatre circuit and are well known to most venue managers.